I ran across this on the web the other day. It really hit my eye. At first glance, I thought, "Round picture frame." It is not that, but my mind went spinning into design mode and I saw this wonderful charger with a plain center and a highly decorated curved rim. It is a form I've done before experimentally, a large plate with a curved down rim. 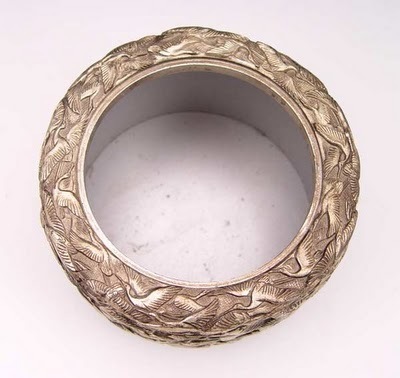 But I have not made one with the plain center and ornate rim. I'm clipping this as a springboard to tack up on the wall of the studio. A reminder of the next project, perhaps. 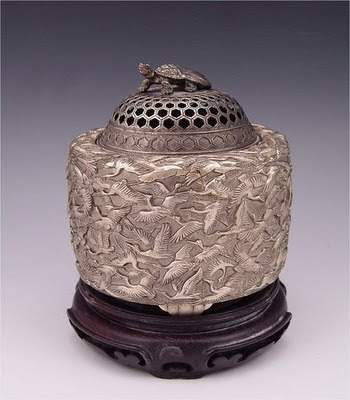 It's an antique silver Japanese incense jar. The first photo was an overhead shot showing the bottom and rim of the piece. Not a bad form either. On the whole, Japanese silver is underrated and under priced. Only recently has it come into it's own as valuable pieces. Same goes for Mexican silver. The quality is high in silver content in both productions, but until the value of silver began to go up, the work had little attention except for affectionados.